John Reichard, 98, of Toledo, Ohio, passed away on September 9, 2018. He was born on December 1, 1919 in Toledo, Ohio, to parents Mary (Sutton) and John Reichard. 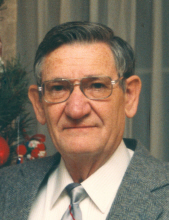 John was preceded in death by his wife Inez, daughter Cherie, brother Harold, and sisters Ann and Hazel; and grandson Todd Leu. Surviving are his loving children Sally (Robert) Leu, Dave (Mary Ann) Reichard, Mary Lewis, and Jim (Linda) Reichard. He had 10 grandchildren, 11 great grandchildren, and 3 great-great grandchildren. John and Inez lived a full life together for 70 years. He was an active member in Faith Community United Church of Christ. John worked as a tool and die maker until he retired. He was an incredible mechanic and tinkerer, who could fix nearly everything. Most of all, he was wonderful husband and dedicated father. He loved to play cards, travel, dance, and most of all, spend time with his family. John was kind to everyone he met and was best known for his sunny and upbeat personality. He was the cheery optimist, but above all, he was a thinker and a realist who taught his children what it meant to be a good person. He was loved by many and will be greatly missed. Visitation will be held at the Walter Funeral Home, 4653 Glendale Avenue, Toledo, on Wednesday, September 12th from 6 to 8 p.m. Funeral services will begin at the funeral home on Thursday at 1 p.m. Entombment will follow at Toledo Memorial Park, Sylvania, Ohio Please visit walterfuneralhome.com or our Facebook page to leave condolences for the family. To send flowers or a remembrance gift to the family of John Reichard, please visit our Tribute Store. "Email Address" would like to share the life celebration of John Reichard. Click on the "link" to go to share a favorite memory or leave a condolence message for the family.